I've recently been reading books about Arctic adventures, especially those that occurred before modern ships and technology. 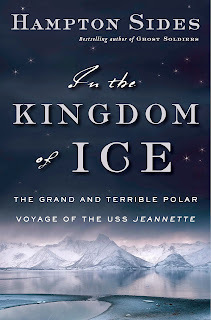 I just finished In the Kingdom of Ice: The Grand and Terrible Polar Voyage of the USS Jeannette (Doubleday, 2014). The author, Hampton Sides, takes you along on the harrowing journey of the captain and crew of the ill fated Jeannette as they try to be the first to reach the North Pole. In the late 1800s, the Arctic was an uncharted wilderness, the end of the earth. Wild theories abounded. Many thought that the top of the world was surrounded by an Open Polar Sea, free of ice and warm in temperature. If someone could just break through the frozen ring that girdled the globe, the quest for the North Pole could be achieved. This widely held speculation caught the interest of James Gordon Bennett, the wealthy owner of the New York Herald, the same paper that sent Stanley to Africa to find Dr. Livingston. Big adventures caught public interest and sold papers. This made Bennett willing to finance a scientific expedition. He selected George De Long to captain a 146 foot long three masted wooden sailing and steam powered ship. After a lengthy refit at the Naval Yard in San Francisco, De Long and his crew of thirty-six hardy and skilled men boarded the Jeannette for a trip of adventure and discovery. The book is rich in detail, some say too much, but it helps put the story, people, and places in context. The late 1800s were exciting times. Inventions such as electric lights and telephones were just being put into use. The Jeannette incorporated some of these new inventions and more "modern." But for me, the most interesting part was how the traditional ways of the peoples of the north made survival in the harsh Arctic environment possible. Without their support, no one would have survived the final ordeal.